Ideal customer profiles (ICPs) are the key to organizations becoming data-driven. We recommend every team starts here. Your ideal customer profile is a strategy tool to align your sales and marketing teams with a common definition that’s grounded in data. ICPs force focus. A well-formed ideal customer profile will clearly also define your customer data model and the data you need to source so that your sales and marketing teams can identify & target best-fit customers, and personalize their messaging to them. ICPs make it possible to use data to make sense of your leads and customers. Without a clearly defined ICP, we see teams have an abundance of data they’re unable to harness, or a lack of data to drive visibility, coordination, and action. Both these outcomes result in a lack of focus, reliance on “instinct”, and mis-trust in data. You can also use this ideal customer profile process for to focus marketing campaigns. 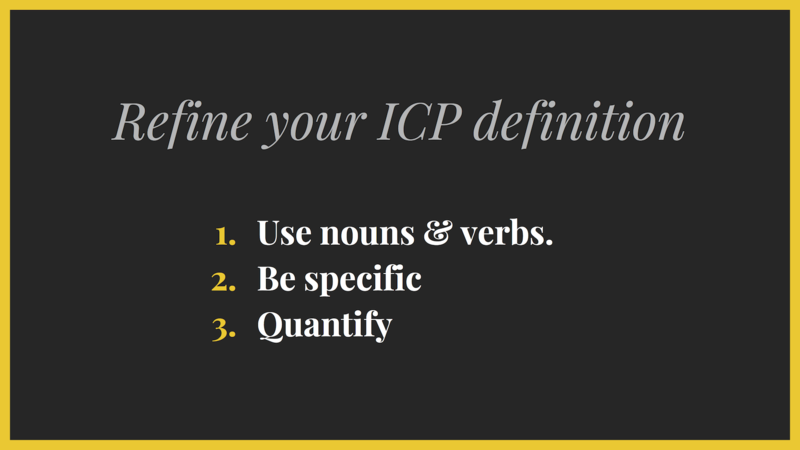 ICP-style definitions will focus your campaigns, define your data model, and align your teams. In the first chapter of The Complete Guide to Customer Data, we’re going to share our ideal customer profile framework, with examples for you to work through. Customer profiles are different to personas. You cannot objectively qualify a lead based on “Marketing Mary” or “Sales Sally”, but you can using objective data like their job title, company size, form fills, and so on. Personas have a different purpose. If ideal customer profiles are WHO you sell to, then buyer personas outline HOW to talk to and sell to them. Personas shape your content, brand & messaging. (Personas are often referred to interchangeably with ICPs. For the purpose of this entire guide, they are separate concepts). Similarly, your target audience profile is different from your target customer profile. Your target audience represents the groups of people to reach and market to; your target customer profile is a subset of this group. Your target audience profile may include non-buyers like influencers, partners, and analysts, as well as people and companies tangential to your ideal customer profile. Lesson #2: What is an ideal customer profile? Your ideal customer profile is a clear, common, objective definition of who the ideal buyers and users of your product are. In B2B, this means the target company profile, as well as understanding the associated buyers, users, and champions within an organization. 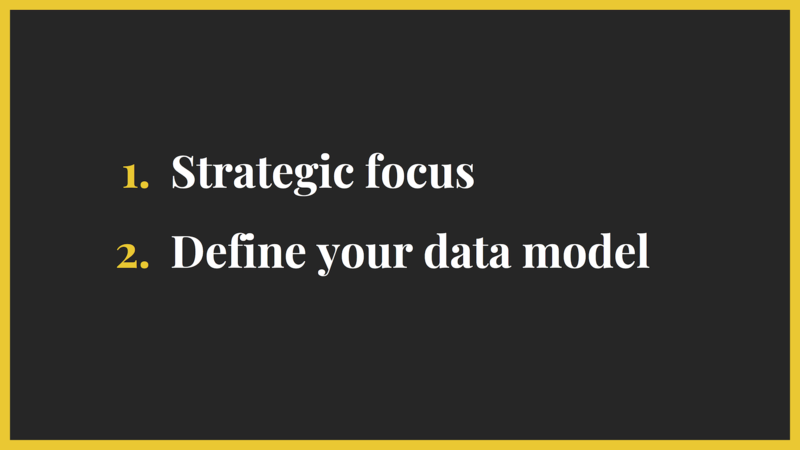 Your definition will serve a strategic focus (who you are and are not selling to) and outlines your customer data model. Customer profiles are the primary data object. All known data about who that person is and what they’ve done can be associated with them in a customer data model. In B2B, you will also have company profiles for all known data about the company and any people that can be associated with them. The process for defining person-level and company-level customer profiles is very similar. An ideal customer profile will define what data you need. This will keep a leaner, more manageable data model which is easier to source, and make it easier to focus your teams. Pricing team could experiment with pricing that could extract the most value from one type of user and how they used the product. 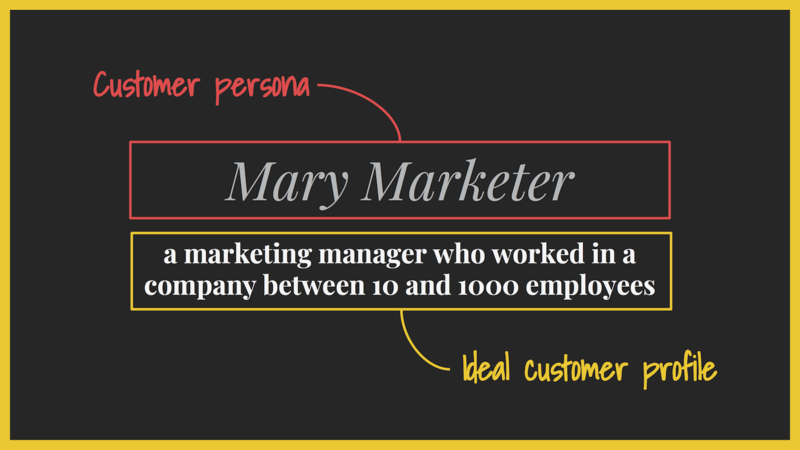 The strategic focus on “Mary Marketer” drove alignment and decision making with teams across the company. However, “Mary” is just a common language. A persona. Yes, the marketing team’s content would be different (HOW they talk to and sell to “Mary”), but WHO they were targeting was the key differentiator. The attributes (the data) that described each person was different. 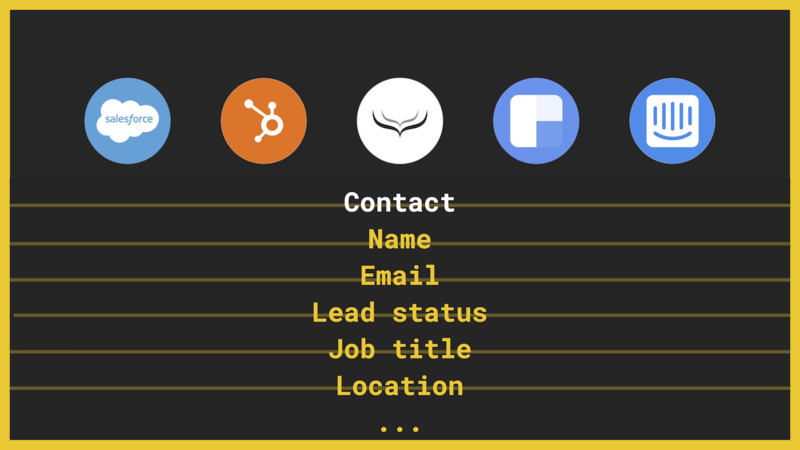 HubSpot’s example of an ideal customer profile is not “Marketing Mary”, but “marketers within companies of 10 to 1000 employees”. 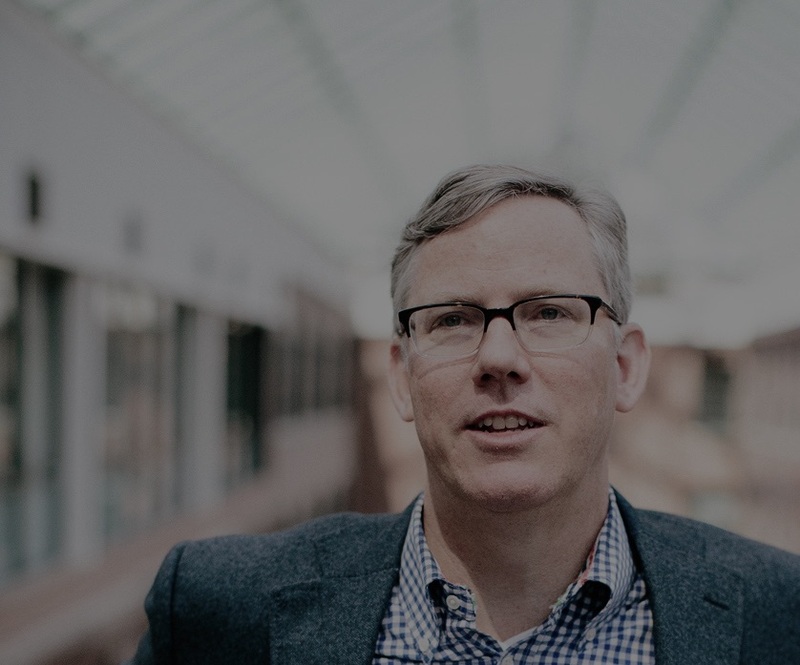 The key to driving strategic focus and team alignment is with a clear, common, objective definition of who the ideal purchasers and users of your product are. This is the objective for your team & oragnization. Different organizations have different levels of cross-functional collaboration. For some, it may be very natural and every day; for others, this is completely alien. But because customer data is spread across tools across teams, you cannot ignore the need to get everyone who owns customer data together. This is your common lifeblood. We recommend getting everyone who owns customer data in a room together. This can be beyond just sales and marketing leadership. Support, customer success, product, finance, operations. Customer data sits across the entire organization. The first goal: agree together on a simple, common definition of what your ideal customer profile looks like. This doesn’t have to be perfect, or complicated, or even objective (yet). Some people might be better at expressing a definition than others, so try to make space. The most important thing is to come to a common agreement. Different teams and people will disagree over what is ideal and why. This is a healthy bi-product of good customer data management. It forces alignment between teams (since they have to share data). The arguments are part of that re-alignment and ‘healing’ process. Opinions, even if based on some first-hand experience, should be challenged by data (especially if you have a larger sample than your team’s anecdotes). This should be the basis for all arguments made for defining your ideal customer profile. The “real” analysis might need to happen outside a meeting with someone who has the access and skillset to test the assumption or suggestion. In the meeting, to keep things forward you, create scenarios where the assumption is true or not true and move forward. 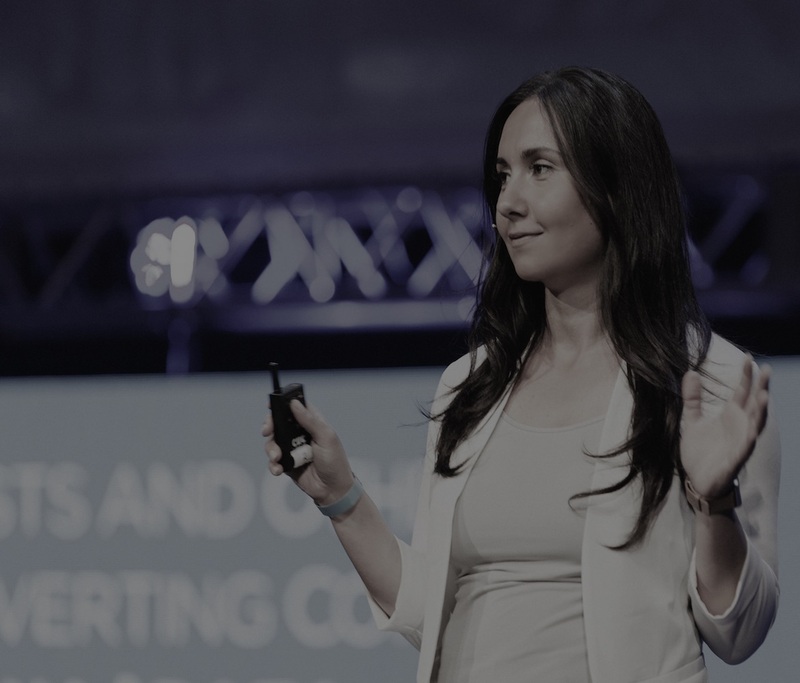 At Shopify, Hana Abaza joined Shopify Plus’s new marketing team and quickly found a lead source bias against Adwords. Despite the conversions being the same as other lead sources when followed up with, the sales reps felt they were lower quality. All the while, there was significant spend going into acquiring Adwords leads. “Adwords leads are bad” says one sales person. And then ALL the sales people say “Adwords leads are bad”. But Adwords leads were not bad, and actually did convert if sales followed them up. With the support of sales leadership, Abaza ran an A/B test to change the lead source of some of their Adwords leads to match a favorite “Contact Us” lead source the reps appeared to follow up with quickly. The test showed that the conversion rates of the test cohort proved to be equivalent to the real “Contact Us” leads and proved the bias in behavior to be falsely judged. 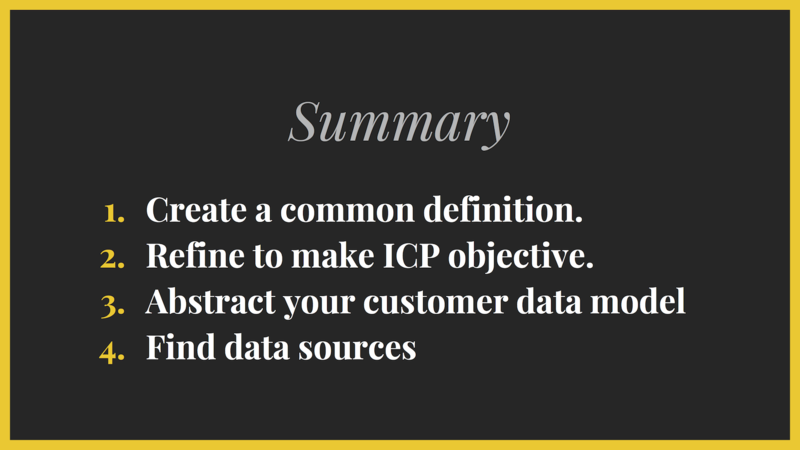 To tie your ICP definition to data, it needs to be objective. Use nouns and verbs. Avoid adjectives. 1. Use nouns and verbs. Avoid adjectives. Nouns are “things”. Verbs are “actions”. Nouns and verbs are much easier to tie to the types of data (like attributes and events) that you can collect and use. Companies with less than 100 employees. Or less than 10 employees. Companies which are in the “tech startup” industry. You need to strip out the “fluff” and subjective language, and replace it where you can with nouns and verbs - “things” and “actions”. Why would you want to serve one customer over another? Many biases might come out here. But specificity can be strategic. If prefer to serve (or can only serve) specific market segments over others, you should codify this in your ideal customer profile. Explore the bottom-up view too — not just strategic top-down choices. Your sales reps, support reps, and “front line” team will have their own biases and experience over what makes up an ideal customer. Tighten and focus your definitions with these insights. Any useful measure that can be quantified, should be quantified. Tie your definitions to quantifiable measures. This makes it very straightforward to source data and create rules with your data to segment qualified accounts. At Hull, our common starting definition might be something like this. 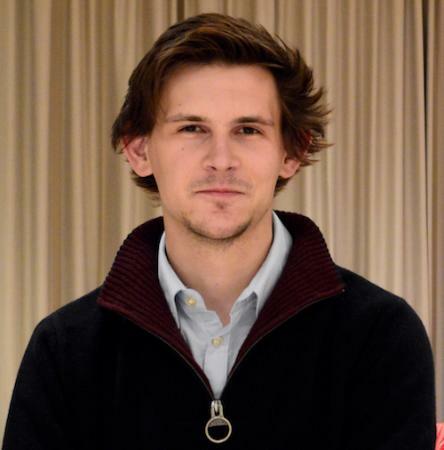 “Growing startups with many sales & marketing tools”. “Growing startups” with “many tools”. We stripped out this fluffy, subjective language and replaced it with something more specific and objective. We put a number on the revenue component. We’re specific about tools (e.g. teams big enough for Salesforce & Redshift = good indicator they’re investing in their data layer). Now you have your objective definition, test it with your real leads and customers. Review the profiles in your customer databases. Play “hot or not”. Do they match your definition? Who’s missing? Who’s been included by mistake? What tweaks do you have to make? Go back to the first stage and revise your core definition as a team. It is vital that your objective ICP definition still has consensus with everyone who owns customer data. Remember, customer data is your common lifeblood. You need iterate through this process until you have a clear, common, objective definition of your ideal customer profile that accurately segments your leads and customers. Now you have a clear, common, objective definition of your ideal customer profile, you need to define your customer data model. This is the data that your tools and teams will capture, store, and identify leads and customers as ICP and not-ICP. This is your “master customer data model”. The goal is to outline what makes up the custom data model, where to source the right data from, and how to use it in lead and customer profiles across all your tools and teams. If every lead and customer has these two attributes populated, then every lead and customer can be marked as either “ideal customer fit” or not. In the second example for Hull, our ideal customer profile was more complex, so there is more to our customer data model. Assign data types to entities (like people or companies). Now you’ve abstracted the data types, you need to assign to an entity. In B2B companies, this is usually a person (contact, user, lead…) or a company (account). Each of these entities will have at least a name, an identifier, and contact details. For a company, this is often their website domain name. In reality, your master customer data model will become significantly more complex than this. You may have long records of contact details, lifecycle stage, location data, dates of signup, company, industry, and so on - all needed for each of your team’s day-to-day operations. The master customer data model is what is shared across tools - what is common between everything. This is particularly important for any tool that maintains a lead or customer profile such as CRM, email, chat, support ticketing, or product tool. You need to replicate the context across each of these tools. Your master customer data model is the minimum viable context you need to understand who a person or company is. Hull is a customer data platform. Combine data from all your tools, tracking & databases into a unified customer profile. Then cleanse, enrich, segment & sync that data across all your tools in real-time. Now you’ve abstracted your master customer data model from your ideal customer profile definition, you need to understand where you can source (or shop for) the data to fill it in. There’s no value in an ideal customer profile if you cannot map it over all your real-life leads and customers. For every element of your data model, you need to understand where you can source this data from. Data direct from your leads and customers might be ideal, but (sometimes) can cost conversions. Leads and customers may or may not be a reliable source of data either, depending on your industry (think of insurance fraud). Inferred data from other behaviors might be useful. If you can capture and correlate one thing with another, you can use this to fill in your data model. For instance, if someone keeps loading your “templates for marketers” or visiting your “enterprise pricing” page, that behavior tells you something about their interests and intent. You can design your website and app like a giant form to capture data through behavior. Finally, there is sourcing data from third parties. Data enrichment providers are common in B2B to fetch publicly available data to “fill in the blanks” on a lead or customer profile to ideal the key attributes. Based on our example, we could source job title and number of employees from forms or data enrichment. For each of the attributes in your customer data model, you need to define one or more data sources. In the example of Hull’s ideal customer profile, we wanted to data about a person and company. To do this, we fetch data through forms and chat (mostly identifiers), and use enrichment from Clearbit and Datanyze to “fill in the blanks”. Now you've studied the theory and process, you need to put it into practice. 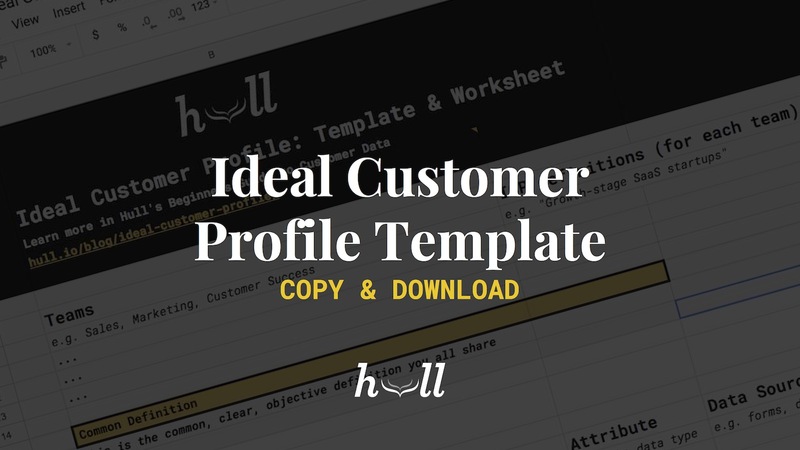 Using this blog post with our ideal customer profile template and worksheet, you can define an ideal customer profile to give strategic focus and define your customer data model. With your customer data model defined and data sources found, you can identify the profiles of ideal people and companies. Next, you need to understand how far along the buyer and customer journey they are. This is a process called customer journey mapping. It enables you to outline the different customer experiences you need to create, track, and attribute.